Only about 3% of the diamonds in the world are emerald cut. They are an extremely unique, yet very desirable type of diamond that has a vintage look and sparkles differently than the round cut variety. Diamonds are a timeless asset to be used as a store of wealth, and such a store of wealth gives you valuable collateral for asset loans on emerald cut diamonds from a pawnbroker. The value of a diamond is determined by its 4 Cs: carat, colour, clarity and cut. If you’re asking the question “Where can I pawn my emerald cut diamond in London?”, New Bond Street Pawnbrokers is a good answer. What is the most important metric when I pawn my emerald cut diamond? The carat weight is the measurement of how much your diamond weighs – a single carat is equal to 200 milligrams. There are 100 points that a single carat is subdivided into, enabling measurements to be as precise as possible. Diamonds weighing less than one carat are usually expressed as a fraction or a decimal of their points. Diamond prices tend to increase most with their carat weight, because larger diamonds are much rarer and, thus, more desirable. However, two diamonds of equal carat weight may not be valued the same, because the other factors also influence the value. So although carat weight is the most significant determining factor of value, the other criteria also play a part. Is an emerald cut more or less valuable than others? Diamonds are loved for their ability to reflect light and sparkle spectacularly. During an appraisal, we don’t necessarily consider any style of cut to be more valuable than another; the cut grade is really about how well the diamond’s individual facets interact with the light. It requires skilled craftsmanship to fashion a stone to deliver the magnificent sparkle that only a diamond can achieve. The cut, therefore, is the most technically complex metric to analyse. Our appraisal experts have undergone extensive training, and have acquired a wealth of experience, in order to be able to assess this metric accurately when our clients seek loans on emerald cut diamonds in London area. Any structural imperfections impact the clarity grading of a diamond. Blemishes are flaws that affect a stone’s surface, while inclusions are generally crystals of diamond or some foreign formation within a stone that affects its internal composition. During an appraisal, our associates will inspect your stone through a 10x magnification jewellers’ loupe to ascertain the grade of clarity that is most appropriate for it. When evaluating the diamond colour of most gem-quality diamonds, the assessment is done on the basis of the ABSENCE of colour. There is no hue in a chemically pure, structurally perfect diamond, so the less coloration there is, the more valuable it will be. There is a grading system to measure the degree of colourlessness, which is assessed under controlled lighting and controlled viewing conditions. 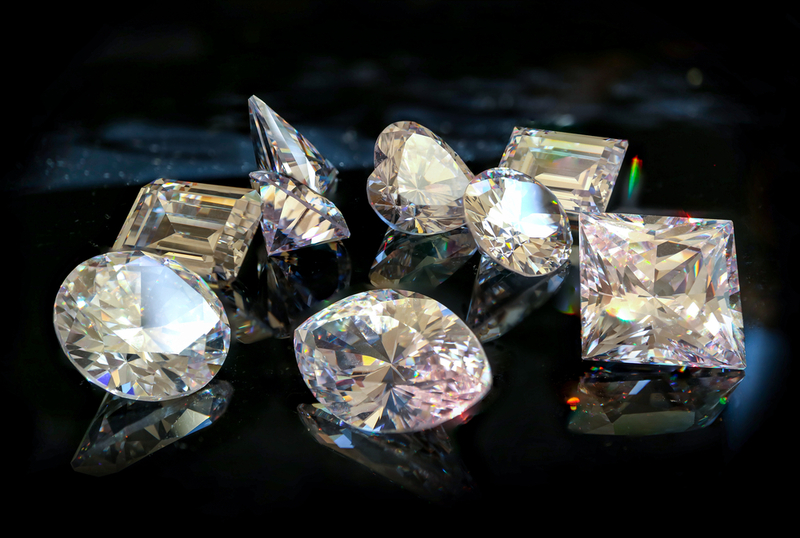 When an experienced, reputable pawnbroker like New Bond Street Pawnbrokers assesses any kind of diamond, they will be evaluating the qualities listed above to determine the value of the loan to be offered. The criteria that determine a diamond’s value are assessed under strictly controlled conditions to ensure maximum accuracy in every appraisal. Anyone asking the question “Should I pawn my emerald cut diamond?” should be seeking the help of the right pawnbroker to handle the appraisal. With over 25 years in the industry, New Bond Street Pawnbrokers is the internationally renowned pawnbroker in London that will strive to make you the best offer possible. Our service is highly professional and discrete, and we are looking forward to hear whether you own the $23.2 million Perfect Pink or a more modest emerald cut diamond!